Lightning branched out high and low over Smacks Bayou Snell Isle St. Petersburg Florida - Nikon D300 Tamron 17-50mm @ f/16 ISO 200 25.2 sec (but card covered most of the time) tripod mounted with cable releaseThis evening I finally had the opportunity to photograph lightning conveniently right from my own back patio. While I was eating dinner I watched and listened to a strong storm approach. First came very heavy rain, always needed for the flaura and fauna of the area, and it also cools things down nicely outside. Lightning trickling out from the clouds above Smacks Bayou Snell Isle St. Petersburg Florida - Nikon D300 Tamron 17-50mm @ f/16 ISO 200 31.8 sec (but card covered most of the time) tripod mounted with cable releaseThe rain for the most part ceased, but numerous lightning strikes were still visible from exiting storm. These conditions allowed me to first get out onto my back patio and then even out into the open to try and capture a few of the lightning bolts dancing all over the sky, as many bolts did not touch the ground, but rather spread like cracking ice parallel to the horizon. 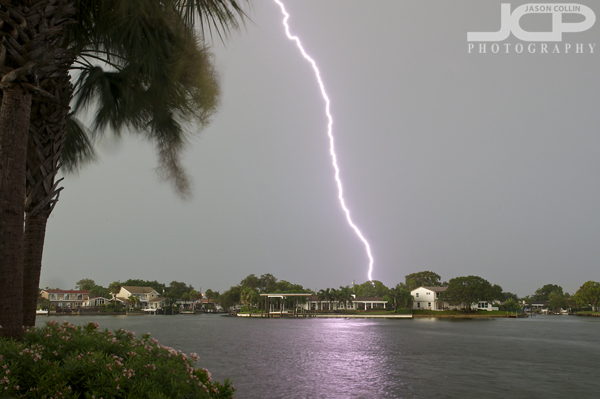 A single strong lightning strike over Smacks Bayou Snell Isle St. Petersburg Florida - Nikon D300 Tamron 17-50mm @ f/16 ISO 200 1.2 sec tripod mounted with cable releaseI used the same techniques for photographing fireworks to make these lightning images. I detailed the shooting process here. I hope to have more chances for different kinds of lightning shots as the summer thunderstorm season continues into August.